North Point Press, 9780865477483, 256pp. The Upcycle is the eagerly awaited follow-up to Cradle to Cradle, one of the most consequential ecological manifestoes of our time. Now, drawing on the green living lessons gained from 10 years of putting the Cradle to Cradle concept into practice with businesses, governments, and ordinary people, William McDonough and Michael Braungart envision the next step in the solution to our ecological crisis: We don't just use or reuse and recycle resources with greater effectiveness, we actually improve the natural world as we live, create, and build. For McDonough and Braungart, the questions of resource scarcity and sustainability are questions of design. They are practical-minded visionaries: They envision beneficial designs of products, buildings, and business practices—and they show us these ideas being put to use around the world as everyday objects like chairs, cars, and factories are being reimagined not just to sustain life on the planet but to grow it. It is an eye-opening, inspiring tour of our green future as it unfolds in front of us. The Upcycle is as ambitious as such classics as Rachel Carson's Silent Spring—but its mission is very different. McDonough and Braungart want to turn on its head our very understanding of the human role on earth: Instead of protecting the planet from human impact, why not redesign our activity to improve the environment? We can have a beneficial, sustainable footprint. Abundance for all. The goal is within our reach. Architect William McDonough is an architect and the founding principal of William McDonough + Partners, an architecture and community design firm based in Charlottesville, Virginia; MBDC, a firm that assists companies in designing profitable and environmentally intelligent solutions; McDonough Innovation, where he is able to advise business and provide targeted ideas and strategic business solutions. 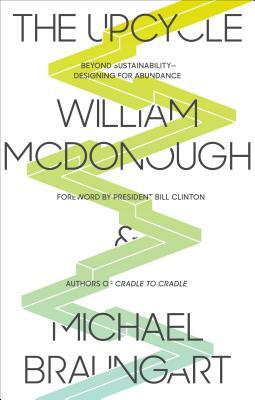 A highly regarded speaker and writer, William McDonough’s co-authored Cradle to Cradle: Remaking The Way We Make Things has played an influential role in the sustainability movement. McDonough partnered with Stanford University Libraries in 2012, on a “living archive” of his work and communications. At the 2014 World Economic Forum (WEF) in Switzerland, McDonough participated as a leader, presenter and convener, and made sustainability a primary focus, for the first time at the WEF. In 1999 Time magazine recognized him as a "Hero for the Planet," stating "his utopianism is grounded in a unified philosophy that—in demonstrable and practical ways—is changing the design of the world." In 1996, he received the Presidential Award for Sustainable Development, the highest environmental honor given by United States. Additionally, in 2009, McDonough led the founding of the Cradle to Cradle Products Innovation Institute to donate the Cradle to Cradle Certified™ Products Program to the public. In 2014, William McDonough was appointed by the World Economic Forum to Chair of the Meta-Council on the Circular Economy. Michael Braungart is a chemist and the founder of the Environmental Protection Encouragement Agency (EPEA) in Hamburg, Germany. Prior to starting EPEA, he was the director of the chemistry section for Greenpeace. Since 1984 he has been lecturing at universities, businesses, and institutions around the world on critical new concepts for ecological chemistry and materials flow management. Dr. Braungart is the recipient of numerous honors, awards, and fellowships from the Heinz Endowment, the W. Alton Jones Foundation, and other organizations.